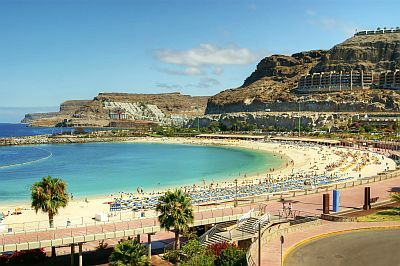 In Gran Canaria, a round-shaped island belonging to the Canaries, the climate is subtropical oceanic on the coasts, that is, very mild and sunny most of the year. Winters on the coasts are mild and spring-like, while summers are sunny and warm; there is also little rainfall, concentrated in the period from October to March. In inland areas, however, the climate varies according to altitude and exposure. 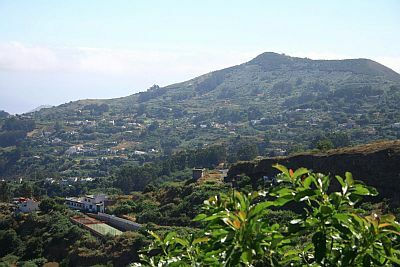 In fact, the slopes exposed to the northeast trade winds receive a moderate amount of rain and are green, while on the southern slopes rainfall is scarce, often below 150 millimeters (6 inches) per year, to the point that the island appears divided in two, the northern part being verdant and the southern one almost desert. The prevailing winds, the trade winds, not only make the northern slopes more humid, but also temper the heat along the coasts during summer; these winds blow more intensely in the afternoon, when they are often moderate or even quite strong. The days of calima, characterized by abnormal heat and light wind, due to hot air masses from Africa, are relatively rare, and are more frequent in spring and summer: in practice these are the only days when the temperature exceeds 30 °C (86 °F) and the heat is unpleasant; from July to September, it can even reach 40 °C (104 °F). The calima is felt also on the highlands, and often even more than in the plains because warm air is lighter and tends to rise, while the coast can be mitigated by the sea. Along the coasts, and therefore also in the major cities, such as Las Palmas de Gran Canaria, Ingenio, Telde, daytime temperatures are very mild in winter, with highs around 21 °C (70 °F) in January and February, and warm in summer, with highs around 27/28 °C (81/82 °F) from July to September. Here are the average temperatures of the airport of Gran Canaria, located in the eastern part of the island, near Ingenio. The rain pattern is Mediterranean, which means that the bulk of the rain falls between October and March, since it is the time when the Canary Islands can be reached by some Atlantic fronts; in summer, on the contrary, in practice it never rains. The total amount of rain that falls in a year is still very low, below 200 millimeters (8 inches), so it's at desert levels. Even in autumn and winter, weeks can pass without a drop of water falling, although occasionally there can be more intense rains, as happened in the past from October to February. 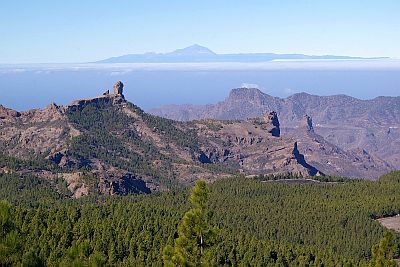 The amount of sunshine in Gran Canaria is very good throughout the year, however, in addition to the low pressure systems that may pass over the island during the October to March period, in summer cloud banks can form on the Atlantic and reach the island. On the northern coasts, and especially on the mountain slopes exposed to the north, local clouds and fogs can form. The southern coast is therefore the sunniest one. Here are the average daily sunshine hours at the airport. The sea in Gran Canaria is quite cold in winter, though not prohibitively, and remains cool in summer. 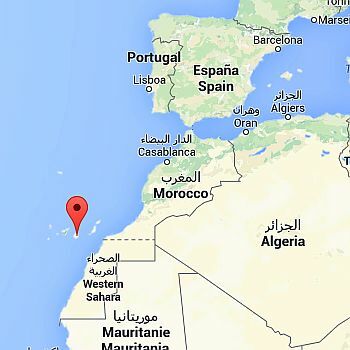 In fact, the island is located at a low latitude, almost at the Tropic, but in this part of the Atlantic Ocean a cold current flows. Those who live on the island usually swim in the sea even in winter because they are accustomed to it, and also Nordic tourists or those who do not suffer from the cold. Anyway, the sea temperature ranges from 19 °C (66 °F) between January and April, to 23 °C (73 °F) in September and October. The capital, Las Palmas, is located in the north-east of the island, where also the beach called Playa de Las Canteras is located; other famous beaches are located in the east and the south of the island, where also the Maspalomas Dunes are found, a small sand desert along the coast. In inland areas, the weather gets cooler as you go up in altitude, and as mentioned the north side has a cool and humid microclimate, with rains of a certain importance from October to March, and even cloudiness and mist are more frequent, in fact there are several towns that are situated in a green environment. At 600/700 meters (2,000/2,300 feet), the daytime temperatures are about 16 °C (61 °F) in winter (and in unheated houses it's cold ...) and 25 °C (77 °F) in summer. The highest peak is Pico de las Nieves, located in the center of the island, and 1,949 meters (6,394 feet) high. At this altitude, winter is cold, in fact, highs hover around 10 °C (50 °F) and lows are just above freezing (0 °C or 32 °F); sometimes the temperature can drop below freezing and even snow can fall. In summer, the temperatures are pleasantly warm during the day (but the sun is very strong, so it requires adequate protection, with a hat and sunglasses) and cool at night. From the top of the mountain you can see Mount Teide, the highest peak of Tenerife and of all the Canary Islands. The best time for a beach holiday in Gran Canaria is from May to mid-October. In the first period (May-June), the air temperature is a bit lower and the sea is a bit colder, but the days are slightly longer. If you want to visit cities and go on excursions to the interior of the island, you can choose April, May and the first half of October. In winter, you will appreciate the mild temperatures and you can often sunbathe, although we can not exclude some days of bad weather. You can also combine a trip to Pico de las Nieves, in search of the snow, with an afternoon on the beach. On the other hand, weather disturbances can bring high waves, generated by winds different than the typical trade winds, and that can be appreciated by surfers. In winter: bring light clothes for the day, a sweater and a jacket for the evening, and possibly a raincoat or umbrella. To climb Pico de las Nieves, a down jacket, a hat, gloves, hiking boots. In summer: bring summer clothes, but also a scarf for the wind, a light sweatshirt, a light jacket for the evening and windy afternoons; comfortable shoes for hiking. To climb Pico de las Nieves, hiking shoes, a sweatshirt and a jacket for the evening.